Historic log studio cabin with incredible Flathead Lake views. Newly restored with antique furnishings. Nestled in a cherry orchard, this cabin is perfectly designed for 2 guests (lay-down couch accommodates 2 more). Fully equipped kitchen and bath, large deck with barbecue overlooking the lake. All linens, towels and cooking equipment are included. Walk or drive to Yellow Bay State Park and enjoy the crystal clear water of Flathead Lake. Park has great swimming beach, boat ramp and picnic tables. 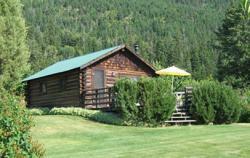 Directions: Authentic Montana Log Cabin is located 14 miles south of Bigfork and 17 miles north of Polson on Highway 35. Near Yellow Bay on the beautiful east shore of Flathead Lake. Exact directions supplied upon reservation.